Flesk Exhibiting at Comic-Con! Booth #5019. Flesk will be exhibiting at Comic-Con International in San Diego this July 21-25. We will be located at booth #5019. This show will represent the debut of Al Williamson Archives Vol. 1! This collection features this beloved illustrator’s private work, revealed for the first time. It is packed with over 100 drawings. This book will be available to the general public in early August. All pre-orders through Flesk by August 1 get free media mail shipping in the U.S. Details on the book can be found here. 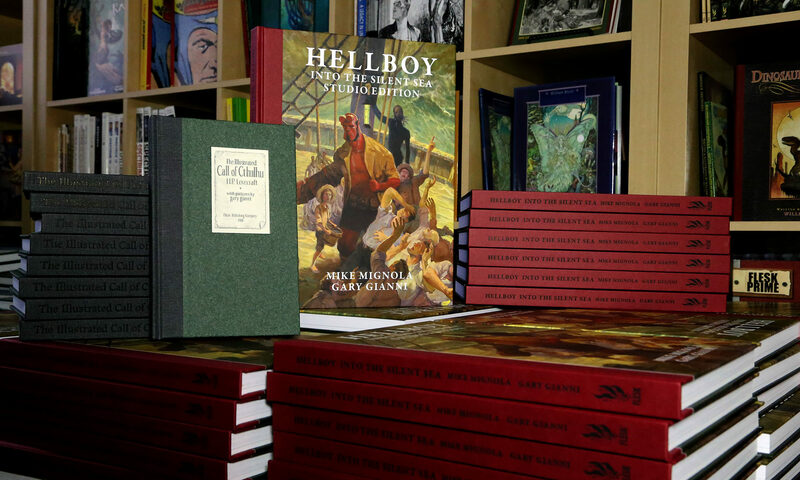 We will have copies of all of our titles including the recently released fantasy art collection Hallucinations by William Stout, James Bama Sketchbook, and the Flesk exclusive Blue Book by Mark Schultz featuring an assortment of Schultz’s preliminary drawings in blue pencil form for Storms at Sea and miscellaneous pieces culled from his personal sketchbook. Blue Book is signed and limited to 1000 copies and only $10.00. Promotional fliers and pamphlets will be on hand for our fall releases. These include Jungle Girls by Jim Silke, The Legend of Steel Bashaw by Petar Meseldzija, Xenozoic by Mark Schultz and Inspirations by William Stout. Five artists we have books on will be at the show. Mark Schultz will be signing at our booth each day as well as his own booth at 4901/4904, along with Gary Gianni. William Stout is just a few isles from us at booth # 4803/4805. Jim Silke is also nearby at booth # 4901/5000. Each of these fine gentlemen will be available to sign books and they will have original artwork for sale. Steve Rude is a guest this year. He will be doing a painting demonstration on Thursday from 1:00-3:00 in Room 18. On Friday from 12:30-1:30 there will be a special panel celebrating the lives of Frank Frazetta and Al Williamson held in Room 3. “Remembering Frank Frazetta and Al Williamson” will be conducted by Arnie Fenner. He will be joined by Mark Schultz and William Stout. We look forward to seeing you at the show! Please note the Flesk offices will be closed from July 20-26. All emails and messages will be replied to promptly as soon as we return. Full details on all of our books and the most recent news can be found on our website, and my blog. Thank you for your support. Feel free to contact me with any questions. Harvey Dunn and The Legend of Steel Bashaw Books in Previews July 2010! Orders Due July 10th! Harvey Dunn: Illustrator and Painter of the Pioneer West and The Legend of Steel Bashaw are listed in the July 2010 Previews Catalog. Orders are due by July 10. I appreciate all of your help by letting your local comic shops know about the availability of these books. Click on the title names for full details on the books. Both are in full color. The denoted “PC” in Previews for partial color is incorrect.